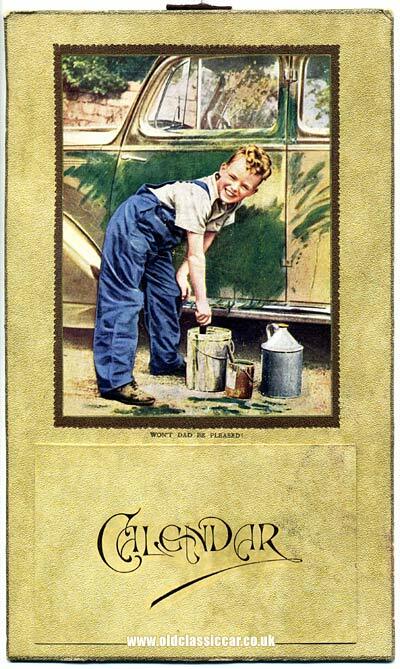 A Vauxhall 14 appears on this humorous post-war motoring calendar. Homepage. This page: An amusing motoring-related calendar features a 14hp Vauxhall from the late 1940s. Re-painting a classic Vauxhall 14hp saloon. The actual calendar section, which originally featured beneath a flap, is long gone, so I can only guess at the age of this item. The car reminds me very much of a 14hp Vauxhall, and the lack of full running boards suggests a late-1940's, rather than pre-war, example in all probability. Who published this calendar I sadly don't know. Return to the motoring collectables section for other classic items like this.